We have a social vision of everlasting development and of living in peace as well as being content with one’s job, which is why we provide a better job opportunity to create employment. In the past years we have recruited top-class personnel from all over the world via fair, objective and impartial recruiting activities, and as we take employees as our most crucial asset, the overall wages are above-average. Besides, we provide an environment full of challenges and fun to work in and emphasize the balance between work and private life, hoping that everyone can enjoy the happy family time. Recently we have focused on cultivation of specialists for new-generation materials, chemical engineering, chemistry and etc. We work on R&D with domestic colleges and even donate some hardware & software equipment to them, hoping that via industry-academic cooperation, competent graduates will one day work with us. In addition, our welfare committee is dedicated to public welfare activity. 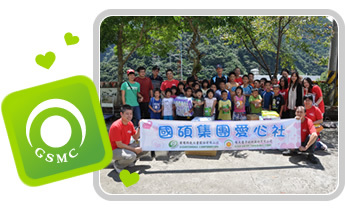 Except for donating some medical equipment to local hospitals, we also organize charity bazaars in order to help social vulnerable groups and send some articles with love to some elementary schools in remote areas. We take advantage of the company’s resources and our employees’ love & passion and organize once in a while various public welfare activities to feedback to our society.